Much of the inspiration that goes into modern fountains for homes and offices comes from art, history, and culture. Some of the most famous fountains from around the world are from periods of antiquity, when great public works were considered to be the basis of a proper society. These days, majestic fountains are still made, and tourists from around the world still flock to some of the more incredible displays of water that mankind has ever conceived of. The Trevi Fountain is arguably the most famous in the world. At 86 feet in height, and 161 feet in width, it is the largest fountain of the Baroque style in the city of Rome. Constructed and unveiled in 1762, the Trevi Fountain is the result of a long stretch of different artists and patrons which were influential in the final design. At the center of the fountain is a carving of Oceanus, the Roman god of water. 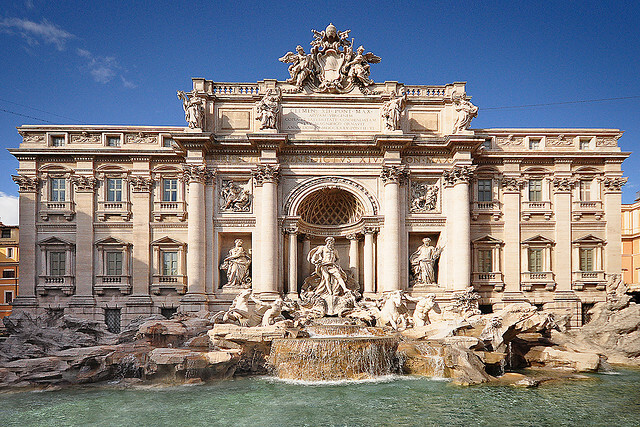 Legend has it that when a coin is tossed into the Trevi Fountain, the owner will make a certain return to Rome. 3,000 Euros, or $3,915 USD are thrown into the fountain every day. 36 miles away from Rome, the town of Tivoli is home to the Villa D'Este, an estate of gardens and water features that are renowned throughout the world for their beauty and their history. A massive garden and one of the pinnacles of Renaissance design, Villa d'Este and its many gardens have gone on to become a huge inspiration on garden and fountain design throughout all of Europe. Large cascade and jets of water are all on display beside statues of famous figures tied to the estate. There is even an area known as The Alley of the Hundred Fountains, which contains a juxtaposition of three diferent, long basins that cross the garden itself. 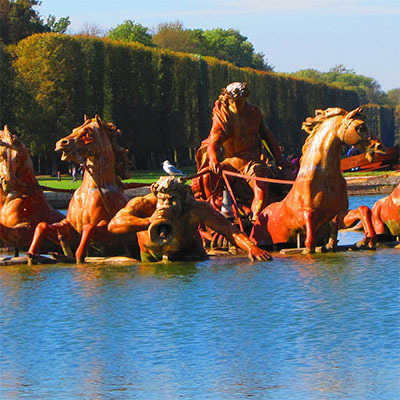 Covering over 800 hectares of land, the Park of Versailles is one of the most famous tourist destinations in the country of France, and is home to many landmarks and fountains that have defined French design and craftsmanship. Some of the more famous fountains within the park include the Neptune fountain and Apollo fountain, both dedicated to the gods of water and the sun respectively. The Neptune fountain has been designed to be able to display 150 distinct water shows and arrangements, making it a tourist favorite. Although it does not have the age or deep architectural history of its European predecessors, America has seen the creation of some spectacular water features. 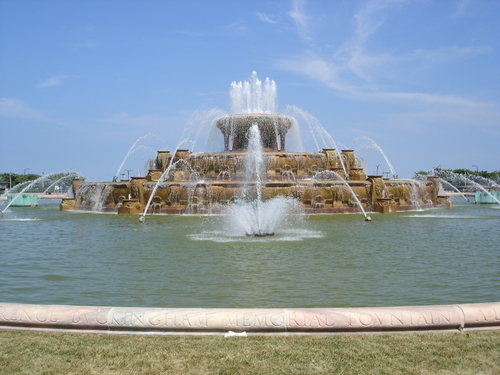 The Buckingham Memorial Fountain, located in Chicago, was built in 1927. It has since been updated with computerized controls and light displays, which run sequences depending on different holidays and events. Another example of highly technical water choreography comes from Las Vegas. Home to all manner of spectacle, fountains are no different; in particular, the fountains of Bellagio Hotel and Casino are “musical fountains,” which play sound and light shows centered around popular songs and classic melodies.